In late June 2013, a gigantic wildfire in the wilderness of Yarnell, Arizona claimed the lives of nineteen brave firefighters, who dedicated themselves to protecting local citizens from its powerful blaze at their own cost. It’s a powerful real-life story of heroism and sacrifice, not to mention game material for a movie to be made out of for the Lone Survivor and Deepwater Horizon crowd – helped by the fact that producer Lorenzo di Bonaventura, who helped make those other films, is also on board for this one – but while there are definitely positives to director Joseph Kosinski’s Only The Brave, there are more than one hindrances that prevent it from being the powerhouse film that it really could have been, and instead has to settle for being a fairly decent tribute to the fallen. 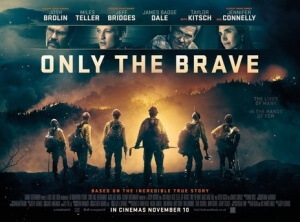 The film isn’t so much about the Yarnell fire itself, but more about how the group of firefighters came to be the heroes they are remembered as being; Josh Brolin’s Eric Marsh is their leader, and he spends the first half of the film attempting to work his team towards a “hotshot” status, which means that they would be fully certified to tackle some of the biggest and most dangerous wildfires across the state. One of his new recruits is Brendan McDonough (Miles Teller), a junkie who vows to get his life back on track when he learns his ex-girlfriend is pregnant with his baby, and he quickly becomes integrated into the team, who soon enough earn their name of the Granite Mountain Hotshots. Things seem to be going well for everyone (or at least, they appear to be), up until that fateful day in Yarnell, Arizona. If it sounds like I’ve just given away the majority of the plot, that’s because I have; one of the problems with this film is how there isn’t a solid enough narrative to keep it all stuck together, and it strives so hard for drama in places that it really doesn’t feel legitimate. Your mind may tend to wander more than a few times, especially in scenes where nothing of particular importance or dramatic interest is going on, and because there isn’t a whole lot else to latch onto, specifically in the first half, it can feel like a slog to get through. Its bloated running time of just over two hours sadly ensures that there are many parts of the film that feel like this; Jennifer Connolly, who plays Brolin’s wife Amanda, has a sub-plot where she’s tending to an abused horse that goes absolutely nowhere, while a majority of the firefighters are portrayed as such douchebags sometimes that it is borderline disrespectful to the memories of the real-life fallen (granted, it’s probable they were like this in real life, but even still you should probably portray people that were killed in action with a bit more respect and decency). I personally found it hard at times to even care about what was going on, which for something that’s meant to highlight a tragic loss of life is not really a good thing, and often I would lose interest because it tended to be rather dull. But preventing it from falling completely into obscurity is the acting, which is top notch from everyone in the main ensemble cast. You’ve got actors like Josh Brolin and Miles Teller carrying their scenes with great ease, and then there are those that shine in slightly smaller roles like Jeff Bridges as a confidante of Brolin’s (and looking like he literally just strolled in from the set of Hell or High Water), as well as James Badge Dale and Taylor Kitsch as a couple of the other firefighters. These are a really strong group of actors that can take even the dullest material and bring it to life in some way shape or form, and they absolutely elevate an otherwise lacking script – aside from the third act of the film, which is where the film becomes legitimately heartbreaking and powerfully told – to something that’s perfectly serviceable, but not exactly essential, viewing. Part of me wishes that it could have been a better movie, especially seeing as it’s telling the story of real people who lost their lives in action, but the one that we got has its heavy set of flaws but not nearly enough to say outright that it’s not worth watching at all. It depends what you’re in the mood for; if you want something that will move you as well as have you gripped all the way through, you may be better off with a film like Deepwater Horizon, but if for whatever reason that film’s unavailable then this is a fine alternative. Only The Brave manages to just about do its tragic real-life story justice thanks to the strong efforts of its actors, though it lacks a solid substance for it to pass as an entertaining movie in and of itself.